Award-winning author Jacqueline Woodson will be the keynote speaker for the Sixth Biennial Interdisciplinary Conference on Children's Literature in English, Education, and Library Science. Woodson currently serves as the 2018-2019 national ambassador for young people's literature for the Library of Congress. She is also the recipient of the 2018 Astrid Lindgren Memorial Award, one of the highest international honors in children's literature. In 2015, she served as the young people's poet laureate by the Poetry Foundation. Woodson is the author of numerous books for young readers, including picture books, middle-grade readers and young adult novels, many of which have won national awards. She is best known for her verse novel "Brown Girl Dreaming," winner of the 2014 National Book Award in Young People's Literature. "Jacqueline Woodson is a rock star in the world of children's and YA literature," said Philip Nel, university distinguished professor of English and director of the program in children's literature. "She is the winner of the National Book Award, and the most prestigious — and most remunerative — prize in children's literature: the Astrid Lindgren Award," Nel said. "More importantly, she is a great and versatile writer, creating fully realized characters, many of whom are in the process of figuring out who they are and want to become. I almost can't believe that she will be here at K-State this Saturday. But she will be. I am so excited to hear her." Latrice Ferguson, co-president of the Children's and Adolescent Literature Community, or ChALC, agrees. 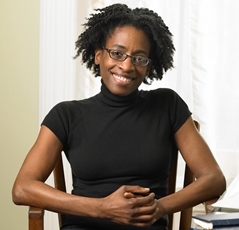 "I'm extremely excited that Jacqueline Woodson is coming to campus for the ChALC conference. I've loved her books ever since I read 'Hush' as a kid in Chicago. Her books were among the first to engage me in reading, and among the first I encountered that featured characters who looked like me. As a graduate student in the children's literature track, I'm so excited to witness her speak as a fan and as an advocate for children's literature and diversity," said Ferguson. For Jamie Teixeira, co-president of ChALC, Woodson's visit contributes to the goals of #KSUnite. "Jacqueline Woodson is an incredible artist and a huge inspiration for many people," Teixeira said. "Woodson's visit comes at a time when discussions of diversity are of the upmost importance. We must continue the progress we've made in campuswide discussions like #KSUnite. We need to keep moving, keep talking about how to address the racial issues in our K-State family and Manhattan community." This year's conference theme is "Boundary Crossings in Children's and Young Adult Literature." In addition to Woodson's keynote lecture, the conference features presentations by Vicki Sherbert, associate professor, curriculum and instruction; Nel; Laura Ransom, children's services coordinator, Manhattan Public Library; and three students in English: Mandy Moore, May 2018 master's candidate in English; Kaylee Kipp, junior in English and women, gender, and sexuality studies; and Kathleen Wallace, May 2018 master's candidate in English. Conference attendance fulfills requirements for Service to the Profession: Professional Growth for undergraduate students in education. More information about the conference, which runs 9 a.m. to 2:30 p.m., is available at the conference website. The conference is free and open to students, faculty and community members, but space will be limited, so advance registration is highly recommended. To reserve your free conference registration, visit the conference website. The conference is sponsored by the Children's and Adolescent Literature Community, the Student Governing Association's Diversity Programming Committee and fine arts fees, and the English department.